Round up all of those iDevices laying around the house and make a studio! Anybody who’s taken a picture or shot a bit of video with an iPhone or iPad knows that the cameras in those devices are getting better all the time. In fact, some of the footage doesn’t look that far off what we might see on television, and it often surpasses what we see gracing YouTube and other online video outlets. So what would make a handful of iPhones or iPads more useful for video pros? How about some cutting edge software that turns two or more iDevices into a fully live-switchable portable studio? 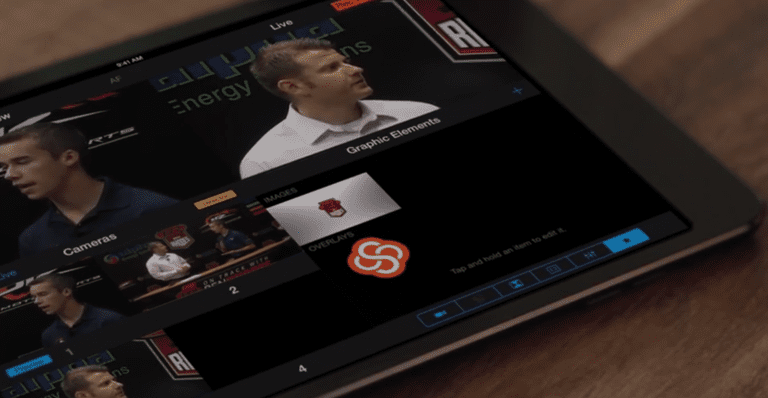 The app allows for live switching between each of the iOS device video streams, meaning we can switch cameras just like a pro broadcast. It does more than that, too. Since the devices being controlled are our everyday iOS devices we are still free to capture raw footage on each of the phones or tablets, while capturing the switched footage on the master device. Save those clips and tweak the edit after the shoot and upload the footage manually, or hit a single button and automatically sync and stream your switched video to your YouTube channel using Switcher Studio’s all-new Cloud Services. That’s right. One-touch, multi-camera streaming with nothing but iOS devices. Pretty darn awesome. Create Dynamic Video: Use the built-in camera on your iPhone or iPad and insert photos, graphics, and overlays in your video. All you need is one device. Share Computer Screen: bring your computer in as a source and setup picture-in-picture. Record 1080p HD broadcast quality video using “Director Mode” and dial in advanced settings to take complete control of your production. Add multiple wireless cameras without huge upfront equipment costs by connecting additional iPhones and iPads to your wireless network. With the new Switcher Studio release, users can easily broadcast live video to YouTube with just a single tap. Sync your Switcher account with YouTube using “Switcher Cloud Services” and start broadcasting directly from the app. Enable YouTube NOW to go live at a moment's notice. Select from previously scheduled events and manage advanced settings. Create NEW YouTube events directly in the app. Set video availability to public, private or unlisted. Get share URL’s for your YouTube LIVE events to post on Twitter, Facebook and more! Run a SpeedTest to automatically configure streaming settings and manage live events in the app or from your online account. Assign one iOS device as your 'main switcher.' Record on the main switcher only, or record on all cameras. The user decides what's best. Set the app to Broadcast LIVE without using storage on your device. Now users don’t have to delete photos or apps to create their video events. Output your program feed or the entire screen to a TV, a projector or an external monitor with HDMI output and AirPlay support. Assign fixed frame rates to your final composition. Capture 1080p HD broadcast quality from multiple angles using iOS devices. Manage advanced settings and record video at bitrates of up to 50MB. Record only, or broadcast at any quality while simultaneously capturing in HD. Preview the completed video on your device as soon as you stop recording. Composite TV quality video directly on your iPhone or iPad and upload immediately. Export your compositions to Apple Final Cut Pro X to make additional edits before publishing (special instructions available for exporting to other editing software). $25.00 USD per month, or for an annual rate of $299.00 USD. There is also a 7 day free trial to see if Switcher Studio is right for you.